Our convenience stores include a variety of services to make your trip easy and enjoyable! Services include, but are not limited to, 24-hour gas and diesel at the pump, propane exchange, deli, hot food items, car wash, lotto, licenses, bait, ice cold beer and cash machines. This is your all in one card. It allows customers the ability to charge purchases, track patronage and earn loyalty points in Synergy convenience stores (except the Barron A & W Restaurant, Colfax Subway, Menomonie Exit 45 Restaurant and Almena and Cumberland Holiday stores). If you do not want a charge account, no problem! Our Silver card offers patronage tracking and loyalty points in Synergy convenience stores with the same exceptions identified above. Note: This card must be used inside the store. Pay at the pump is not available with the silver card at this time. Used for Loyalty points only. This card does not allow patronage tracking or charge privileges. It allows patrons to earn points while fueling outside at the pump or inside the store. Again, be aware of the above exclusions. All three cards give patrons the ability to earn loyalty points and save money. 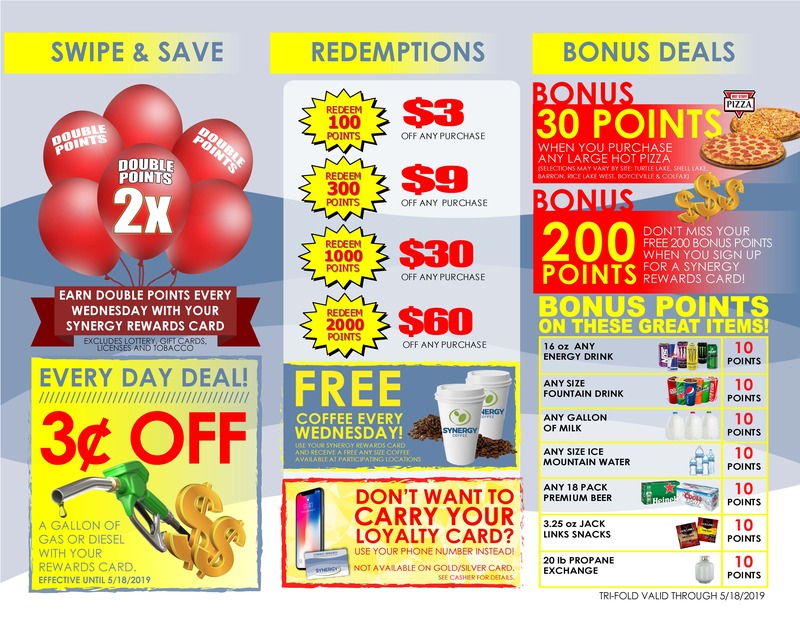 The point program allows discounts for eligible purchases in all Synergy CENEX convenience stores, Rice Lake North and Chetek service stations and at the pump. We will also be running a 60 day “Bonus Buy” promotion along with cents o per gallon for gas or diesel fuel. Customers often ask what is patronage and why is it important to them? Simply defined, patronage is profit distributed to our members and is similar to a dividend payment. Patronage is based on net profit earned by Synergy and is only available from a cooperative. Corporations or privately owned businesses do not pay patronage which is a key reason to do business with Synergy Cooperative. Patronage payments are not guaranteed and determined annually by the Board of Directors. 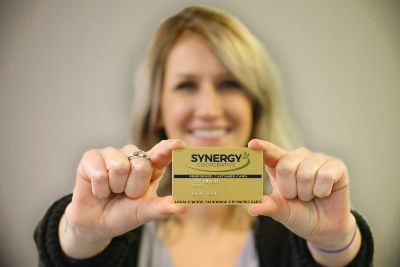 If interested in obtaining a gold or silver Synergy card, adding additional gold or silver cards (businesses, multiple vehicle use companies, farms or families) or upgrading, please complete and email, drop off or mail this form to any of our locations.